So, when will the update finally hit? Magento has been mum on giving an exact release date, but we still expect it to come by the end of 2018, especially since it’s been over a year since the last major Magento release (2.2). Magento 2.3 is anticipated to make an even bigger splash than 2.2, which focused mostly on smaller bug fixes and refinements. 2.3 promises an exciting mix of new core features paired with smaller optimizations and back-end efficiencies. 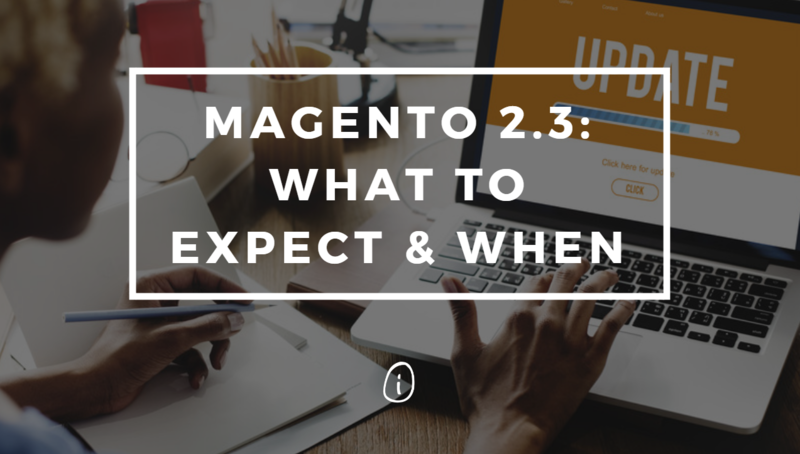 These are the expected features we’re most excited to see from Magento 2.3. Progressive Web Applications (PWA’s) utilize the latest technology to combine the best of web and mobile applications. PWA’s essentially load like any other webpage but offer the user the functionality to work offline, receive push notifications, and much more. Magento 2.3 is expected to capitalize on the many benefits of PWA’s by releasing a ‘studio’ which will contain the tools developers need in order to design their own PWA in Magento’s front-end. Additionally, the Magento PWA Studio will have a demo site feature that will make testing its features much easier for developers. Read more about Magento’s PWA Studio here. GraphQL is a query language for API’s, as well as a server-side runtime for executing queries by using a type system defined by a user’s data. Magento 2.3 will introduce the new GraphQL API language, which will make data retrieval possible for PWA’s. By optimizing these queries, developers will see a much speedier front-end experience with Magento 2.3. Currently, Magento supports only REST and SOAP API requests. In order to also offer support for GraphQL, Magento 2.3 will include an all-new layer that interfaces directly to the query API and could provide even greater functionality in the future by supporting mutations to checkout and payment processes. These mutations would impact storefronts through checkout, order, and my account functionality. The Magento community is helping bring the much-requested Multi-Source Inventory (MSI) functionality to Magento 2.3. This new core feature will allow merchants to natively manage their inventory and tap into separate warehouses for order fulfillment. Additionally, Magento’s MSI system will feature a reservation system for inventory that will replace the direct decrementing of stock. This will virtually eliminate re-indexing and performance issues during peak order times. Currently, altering the schema of a Magento database is done by writing code with InstallSchema and UpgradeSchema. With Magento 2.3, developers will be able to make this change by using a declarative database schema. This will allow developers to define database structures and changes in XML, making it possible to roll back a module or functionality to an earlier version. In an effort to enhance the security of the platform, Magento 2.3 will implement two-factor authentication. This will require users to verify their credentials to sign in by sending a security code to their phone or email. Although two-factor authentication is already used by many companies, the feature is surely a welcome extra layer of security for members of the Magento community. Magento 2.3 will also implement Google reCAPTCHA, a security service that protects websites against spam and harmful bots. In addition to the new two-factor authentication system, reCAPTCHA will help ensure that Magento 2.3 is the most secure version of the platform to date. Magento 2.3 promises to bring significant changes to the platform that will greatly improve the experience for developers. Although a specific release date has yet to be announced, expect it to arrive before the end of the year. Click here for more information on the update. InteractOne can help with your Magento site build or upgrade. Contact us for help with getting your site updated. Or, call us to talk with a Magento expert at 513-469-3345.